Today, Jay Leno announced that Tommy Chong will be on the Tonight Show JULY 9TH, shortly after his July 7th release from prison. Jay claims this will be his first interview after being released. However, Tommy told Howard Stern that he'd appear on his show first. What's the truth? The truth is that Howard is on vacation that week so he blew his shot to have Chong first. UPDATE: BOTH CHEECH AND CHONG WILL BE ON THE SHOW!!! Variety reports that Cheech Marin has signed on for Senor Dracula, a Spanish-language version of the film, Dracula. For the past few months, Senator Brownback has been unable to get the Senate to pass the indency bill. However, earlier this week, he finally succeeded. How did he do it? He piggy-backed the bill onto a military spending bill. This is why it has received so little press coverage. No one noticed. Senators were "for" the military bill so rather than taking the time to remove the indecency portion, they just passed it. But wait, it gets worse. Senator Brownback (who lives in a mansion paid for by a religious cult) wants to increase the fines to $3 million per offense, rather than $500,000. This means that both the entertainer and the station he works for have to pay $3 mill each for a total of $6 mill. Powell's son runs the FCC and can declare anything indecent. What gives him the right? He is President Bush's pawn. First, Tommy was thrown in prison for a crime he did not commit. Now this. 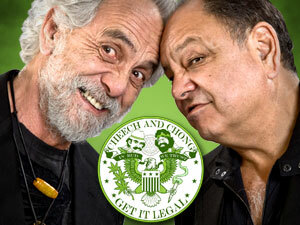 No more Cheech and Chong films are allowed on network television. The future of the Howard Stern radio show is also in jeopardy. He will most likely move to satellite radio. See XMSR and SIRI. Free Tommy outlaw Bobby Capps crashed the Sacramento Gaffers Film Festival to bring awareness to his fellow independent film directors. Among the supporters, were Bobby Capps, JP Nichols and Morrisa Morris of the Placer County Film Commisssion. We've dropped the price of our albums. Now you can get most of the Cheech and Chong albums for $9.99. This person has been making purchases from this site using stolen credit cards for months. We repeatedly get charged back. He always uses fake names and email addresses. We don't know his name, but we know his address. If you live in Canada, please let us know if you live nearby. Variety magazine and other publications have been reporting that 06.08.2004 was to be Tommy's release date. This is false! His actually release date is 07.07.2004. In other news, his daughter, Precious Chong, is performing her play "The Porcelain Penelope Freak Show" at the Zephyr Theater in Hollywood on June 22 and 29. Cheech and Chong Dot Com rolled out a new message board today. We are still tweaking the colors and layout. The board works great though. Sacred Cow Productions had the opportunity to interview Tommy Chong at Taft Correctional recently. The majority of the footage will be used in Sacred's upcoming film about the drug war. Among other things, Tommy calls the drug war illegal and unconstitutional, discusses President Bush and estimates that he's missed out on approximately $5 million of potential income while in prison. This interview is the best we've seen yet.